Twitter has purchased Android encryption software RedPhone–and made it temporarily unavailable to Egyptians. The move comes after one popular Twitter personality was jailed on terrorism and murder charges, and another was sexually assaulted and had her wrists broken while in custody. Update (December 20, 2011): Twitter has announced that Whisper Systems’ TextSecure software, in a surprise move, is becoming open source. According to Twitter’s Matt Graves, “our plan is to open Whisper Systems’ code over the coming months, starting with TextSecure. This will be an iterative release process, as we make sure the code meets legal requirements and is consumable by the open source community.” Source code for TextSecure and RedPhone will be placed online at GitHub. Two of Egypt’s best known Twitter activists were taken into custody over the past month; one is facing murder and terrorism charges, while the other was beaten and sexually assaulted in custody. Although the international press and global observers have lauded the country’s robust social media community, Egypt’s ruling military junta has been taking an increasingly belligerent stance toward social media activists lately. Unfortunately, things could get worse. On Monday, Twitter pulled one of the only available encryption software suites for Android phone calls and SMS text messages off the market temporarily. While it’s unclear which Twitter activists are using RedPhone, the timing is unfortunate. Whisper Systems, a small Android security outfit whose products played a major role in the Arab Spring, lets people send encrypted smartphone calls and text message calls to each other using its RedPhone and TextSecure software. The company rushed an international edition of the previously U.S.-only products to market specifically for Egyptian users in February this year. As a result, Whisper’s products played an important role in the most dangerous days of the Egyptian Revolution; users relied on the software to make encrypted mobile phone calls and to anonymously post SMS messages to Twitter. No relaunch date for RedPhone has been announced. It’s unclear why Twitter wanted an Android encryption firm in the first place, but with the programming talent at Whisper, it may have made it an appealing purchase. However, the odd timing of the RedPhone shutdown could cause significant headaches for Egypt’s massive Twitter activist community. Luckily, Egypt’s elections did not break down. In comparison to much of the violence that has plagued Cairo and provincial cities over the past months, the robust Egyptian Twitter community seemed largely pleased with the events. Yet two of the country’s best known Twitter users were detained this month. Alaa Abd El-Fattah, a prominent Egyptian Twitter personality with over 60,000 followers (pictured above), was charged with premeditated murder with the intention of committing an act of terrorism on November 28. The charges, filed by Egypt’s High State Security Prosecution, appear to be politically motivated. El-Fattah was one of the best known Twitter critics of Egypt’s ruling military junta, and his continued detention is turning him into an icon of the Egyptian left. No evidence has been given to substantiate Egyptian State Security’s charges. The charges filed against El-Fattah have been amorphous and constantly shifting, giving rise to fears he was targeted due to his online activist work. Following a pro-Coptic Christian demonstration on October 9, El-Fattah was charged with incitement and theft of a military weapon by the country’s military prosecutor. These charges were later replaced with civil murder and terrorism charges as El-Fattah’s case ping-ponged between Egypt’s parallel civil and military legal systems. The protest focused on a recent arson of a Christian community center in which 26 Egyptians died. According to bystanders, the Egyptian military opened fire on the Christian and Muslim protesters, resulting in over 20 deaths and 300 injuries. The resulting violence made worldwide headlines and El-Fattah wrote prolific Arabic-language tweets about the Cairo violence. While his decision to primarily write in Arabic has earned him a huge audience among Egyptians, it has also led to increased scrutiny from Egypt’s military junta. Bloggers and Twitter users seem to be targets of the Egyptian military government. Twitter and Facebook users played a major role in Egypt’s January 25 Revolution, and the generals who run Egypt are well aware of this fact. Mona Eltahawy, an American-Egyptian journalist with a massive Twitter presence, was detained by Egyptian riot cops at a bloody Tahrir Square demonstration on November 23. While in custody at Egypt’s Interior Ministry, Eltahawy was sexually assaulted and suffered multiple broken bones as a result of extended beatings. According to a tweet, “five or six surrounded me, groped and prodded my breasts, grabbed my genital area and I lost count of how many hands tried to get into my trousers.” Eltahawy was quickly released, thanks in no part to international pressure–many American viewers may be familiar with her thanks to her frequent CNN appearances. 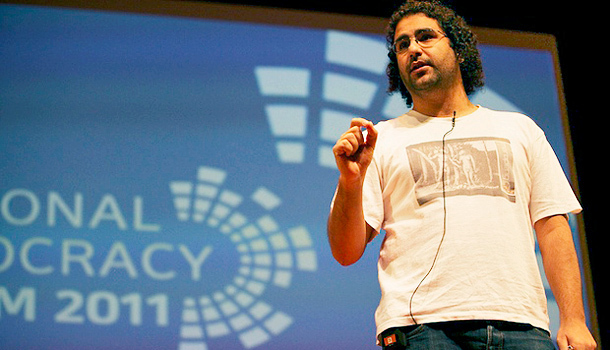 Many other less famous Egyptian democracy activists, however, are still languishing in military custody. Amnesty International has called for the immediate release of El-Fattah, and argues that the Egyptian military has arrested him on the basis of his pro-democracy opinions alone. El-Fattah smuggled a letter out from jail that was published in The Guardian and Egyptian paper Al Shorouk. According to Egyptian state television, the Muslim Brotherhood is leading in the first round of the country’s elections. A second round of voting is expected to take place in 2012.